An experienced team traveled to deepest darkest Ramsey on Saturday afternoon, to play the third match in the Men’s 6 competition. A match of real contrasts followed, with Ramsey having two inexperienced pairs and one very experienced pair. The pairings of Mark B and Paul, Delwyn and Mark P, and Pete D and Peter A, all cleaned up the second and third pairs with ease, but only Uppingham’s first pairing of Mark B and Paul managed to turn over the opposite teams number one pair, who played with great tactical awareness and skill. 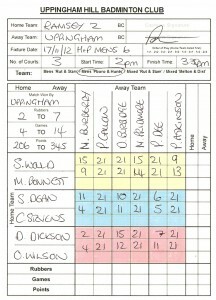 The Mens 6 remain unbeaten now for over a year, well played guys!